Goodbye autumn, hello winter. Well, winter is a time when most people like to stay indoors and keep warm. However, if you’re as adventurous as I am, chances are that you’ll want to spend part of the cold season exploring the wilderness. But navigating through slippery, and at times wet, grounds could prove a challenge even for Peggy Flemming herself! For that reason, it’s always a good idea to stock up on the best ice fishing boots. Maybe you’re feeling lost and wondering how you could possibly find the best alternative on the market. The good news is that you don’t have to do any spade work here. We’ve already taken the trouble of doing that for you. Who said that finding the best-priced boots for ice fishing has to be a daunting task? We’ve created a comprehensive list that will help you make a timely choice. This boot is known for being tall, tough, yet light in weight. Weighing a paltry 200grams, the Bugaboot comes with a synthetic insulation which helps keep your feet warm. A closer look at its interior reveals that it uses an Omni-heat reflective liner. The liner does an incredible job of trapping heat within the shoes. 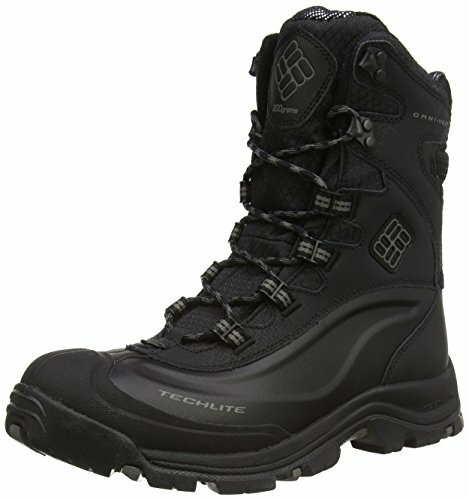 For that reason, this boot easily outperforms the competition when the level of insulation is taken into account. 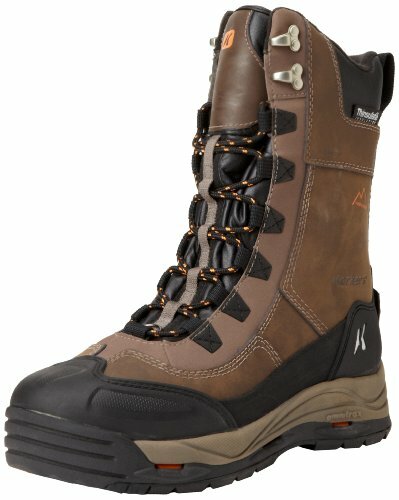 Going for an under $150 price tag, this ice fishing boot presents an awesome option for winter hiking as well. Indeed, it’s an all-weather boot. In particular, it’s weather resistant all thanks to its Techlite shell membrane. The pair also comes with a high cuff along with a solid tongue. So, if you’re looking to trudge through the snow, slush or even mud, the boot won’t let you down. Traction is everything as far as walking on ice is concerned. Fortunately, this boot has what’s probably one of the best levels of traction seen so far. Its sole comes with an aggressive lug pattern which delivers an awesome amount of traction. Indeed, it grips ice and even steep hardpacked snow just like any other premium-quality boot would. 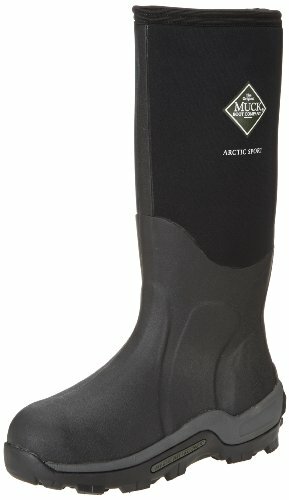 The Arctic Pro series of boots from Muck Boots are, no doubt, the warmest footwear the company has ever produced. They’re designed from an 8mm Neoprene layer which comes alongside a fleece liner and a 2mm thermal foam. Basically, this boot is designed to make sure your feet remain warm even if the temperatures are at below -60 degrees Fahrenheit. In other words, these are the kinds of boots that can see you beat the Eskimos at their game. We found them pretty warm, light in weight and easy to use. Another awesome advantage of this pair is that it’s 17-inches tall. They, therefore, do a good job of keeping your entire foot, up to below your knees, warm. We’d say that this boot presents you with an average amount of traction. The boot would have worked really well if it came with a deeper grip on the soles. But Muck Boot seems to have designed the grip that way for a reason. Indeed, these boots seem optimized for consistent footing. They’re, therefore, ideal for long-distance walks on flat and stable layers of ice or snow. These boots are meant to do nothing short of keeping your feet warm and dry when exploring the vast, snowy outdoors. They’re designed and built by a company, Kamik, which has a reputation that spans over 100 years. So, you can rest assured that the company knows a thing or two about the harshness of winter. 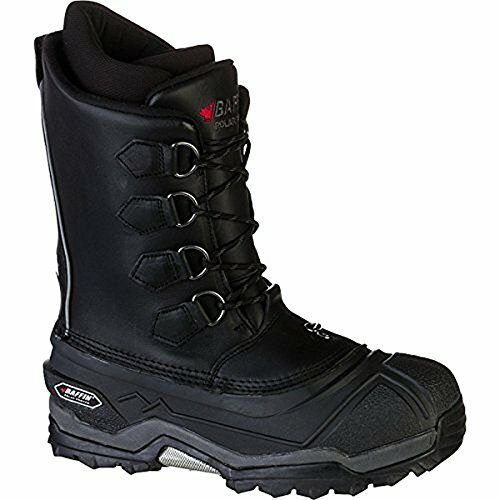 Moving on swiftly, the Kamik ice fishing boot boasts a durable and flexible sole. The sole is particularly optimized for walking through snow. The boot is cold-rated at -40 degrees Fahrenheit. That means you can comfortably wear them even when the world outside is literally fully frozen. 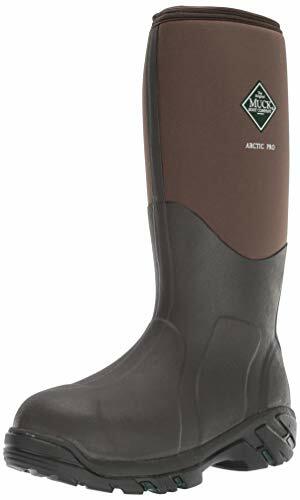 Of course, this is a bit lesser protection compared to the cold ratings of the Muck Boot reviewed earlier. But does the -20 degree difference really matters? Unless you’re planning to go to the remotest part of the Arctic, this minor difference may not be noticeable. A closer look at the shoe’s interior reveals that it comes with a special liner. The liner is not only warm but also quick-drying. This boot has an excellent traction on snow and ice. It has a creatively done sole with deep grips. On top of that, it’s designed to fit snugly all thanks to an adjustable Velcro strap. 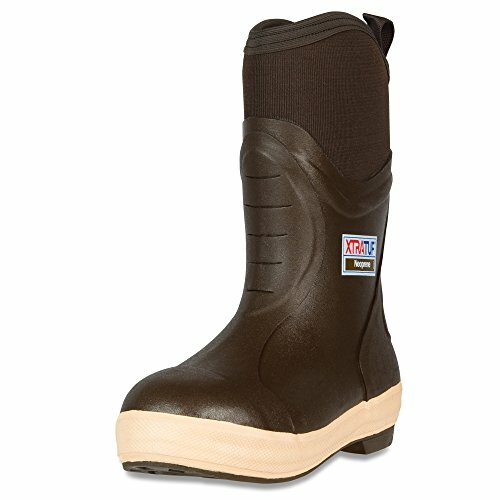 If you love tall, and warm ice fishing boots, this special model from Muck Boots might be all you’ll ever need. To begin with, it is made from leather and synthetic surface. We, generally found it to be highly practical. It’s also light in weight and comfortable to wear even for long hours. Its sole is made from rubber. Its grippy yet super light at the same time. So, if you’re looking for a shoe with good traction – and one that enables you to walk for long distances, this one is a must-have. The fact that the boot is tall makes it a perfect option for anyone looking for some extra heat. You simply need to slide your foot inside this and head out on your fishing mission with no worries. Has a grippy sole which is designed to keep you firmly on every step of the way. So, whether you’re facing rain, slush or snow, this one can see you through it all. This military boot is not only good looking but also historic. In fact, it’s claimed to have been developed during the Korean War, specifically for the soldiers. As you would expect, this is one of the very few boots that are categorized as genuine-issue military boots. A closer look at it reveals that it’s fully insulated and waterproof. That’s because it boasts multiple layers of rubber alongside felt. As such, the boots are pretty warm and comfortable to wear for long hours. Further, we can reveal that part of the boot’s interior contains wool which enhances heat retention. This unique design not only provides protection for the feet but also prevents moisture from penetrating the out surface. 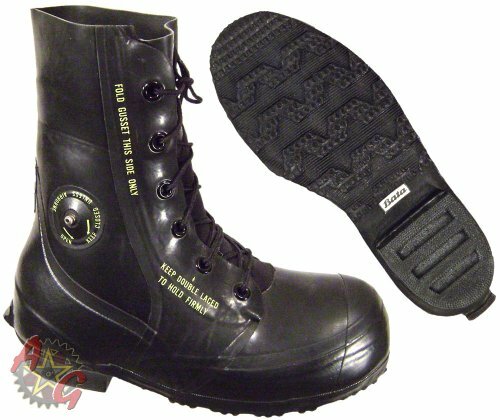 For that reason, we’d particularly recommend the GI military boots for ice fishing for hunting and winter commute. These shoes have what probably qualifies as the best grip of the pack. They’re therefore recommended for dealing with icy and slippery surfaces. Who said that winter boots have to be clunky and unattractive? With the Dream Pairs Lugg, you get an opportunity to protect yourself from the cold while still looking good. The shoes are designed specifically for women. They’re comfortable, stylish, and pretty warm. How do they stand out from the competition? Well, we can confirm that they’re pretty well-made. For instance, they boast a faux suede upper, cozy rubber heels, and fur lining. Best of all, the boots are available in a myriad of color combinations and designs. Therefore, no matter your style, you can be sure to find a pair that perfectly fits your looks. Moving on, this pair boasts a roomy toe box. Therefore, they come in handy in providing room for your toes to wiggle freely. That’s why we’d also recommend the Dream Pairs Lugg for long distance trekking as well. The only red-flag we’d like to raise about these boots is that they tend to run small pretty fast. Therefore, if you’re planning to wear them with two pairs of socks, they may not be your best bet. These boots have an average amount of traction. We’d have wished for more but clearly, these are not the kind of boots to go for when you want to push your adventures to the limits. You’ll feel like you fully belong to the arctic the moment you put your feet inside these tough snow boots. Believe you me, this is the pair with the best rated cold rating at -94 degrees Fahrenheit. So, if you’re looking for a strong and versatile boot, you’ve got to consider this one. Moving on, a closer look at the Baffin Control Max reveals that it has a Thermoplush lining. Besides that, it boasts an open cell polymech foam which provides you with extra cushioning. Further to that, you get a vaporized aluminum metallic surface. The main role of this special surface is that it reflects heat back to the foot, thereby keeping you warm. And what about moisture? Well, this unit is made with a hydromax II layer. This is the same layer used to produce diapers – and it does a good job of wicking moisture away. Add that to the fact that the boot comes with a seam-sealed leather upper and you have a winning combination for winter. The shoe’s base is made from arctic flex rubber. In particular, it boasts an IcePaw high grip technology which makes it ideal for use on slippery surfaces. So, we’d confidently give this a 5-star rating as far as traction is concerned. 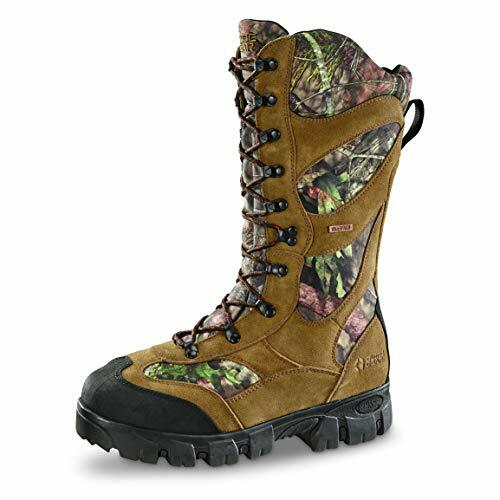 This boot is popularly used for bush hunting but its waterproof surface makes it best suited for ice fishing as well. One thing we like about it is that it is made from stretchable neoprene. This provides you with great elasticity thereby ensuring that even wide feed can fit without being too tight. Further, the boot is made from innovative technology. The technology goes a long way to add durability to the shoes. Simply known as the Alpha technology, this approach ensures you get neoprene that’s fragrance-free. As you would expect with trekking, shock is always an issue. Fortunately, this boot offers a remarkable shock absorption potential complete with a custom-fit ankle design. Above all, you get an interior that’s fully lined with breathable materials making this pair ideal for all-day wear in the cold. Excellent amount of traction. The boot’s outsole is perfectly designed to navigate through any terrain with no major qualms. 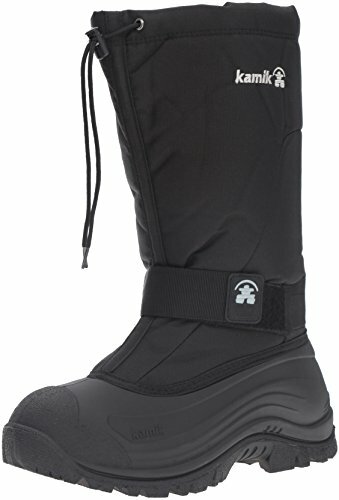 This is not your typical ice fishing boot. It’s loaded with amazing features and insulation – all geared toward keeping you comfortable and warm. With this boot from Korkers, you can kiss goodbye to cold feet. That’s all thanks to the fact that the boot offers you 600 grams worth of premium Thinsulate insulation. The boot is rated at -40 degrees Fahrenheit which means you can use it for pretty much all icy conditions. Despite its tough exterior, the boot boasts a breathable and comfortable inner surface. That’s in addition to a comfortable insole as well. At 11 feet in height, this boot from Korkers performs flawlessly in deep snow by keeping slush and ice from over the top. What’s more? The boot comes with two sets of soles. One is a deep lug sole and the other an ice track carbide studded sole. The latter is meant for the iciest of conditions. This is one of those hassle-free ice fishing boots you can ever invest in. Not only is it easy-to-fit but also incredibly versatile. To begin with, it boasts a 400g insulating liner which ensures that your feet remain warm no matter what. In addition, its sole is pretty well-made. You get a tractor tread design which is purposely designed to be self-cleaning. Whichever way you look at it, there’s no doubt that this is one of the few boots out there made with convenience in mind. So, whether you’re planning for a trip to the mailbox or heading out on an ice fishing expedition, this one has got you covered. And to ensure that your feet remain comfortable at all times, you’ll find that the interior is lined up with air-wicking surfaces. This way, you can rest assured your feet will remain warm even if it’s raining cats and dogs outside. The Kenetrek boot boasts a self-cleaning tractor tread outsole. This may not be the grippiest outsole on the market but it still does a good job on most terrains. Therefore, we’d rate its traction level at 5 out of 10. One challenge with ice fishing is that you never know what’ll happen next. Therefore, it’s always important to be prepared for the uncertain. Talking about uncertainties, the Timber II from Guide Gear stands out with its unique design. To begin with, it boasts a waterproof hydroguard breathable membrane. This membrane ensures that you’re always comfortable no matter how cold the outside is. It’s no wonder this boot has been rated at -58 degrees Fahrenheit. Or is it because it comes with 1,400 gram worth of Thinsulate insulation? Whichever way you look at it, this boot is clearly designed to be a market leader. And to make sure you enjoy wearing it at all times, you get a moisture-wicking mesh along with a padded tongue. The icing on the cake is that you get a rubber toe and an awesome heel cap. So, for a feature-packed boot fit for an all-out war in the winter world. The shoe’s outsole is designed with an oil-resistant rubber. This gives it an excellent grip and, therefore, above-average traction. So, go ahead and face the world without worrying about what lies beneath the harsh terrain. This boot has got your safety well taken care of. Looking for boots that can comfortably serve you as you paddle and portage up the marshy terrain and into the icy wonderland? The Xtratuf boots are your go-to choice when your life becomes an amphibious affair. The rubber boots come with Vibram soles which provide you with an amazing amount of traction. Its upper is unlined which completes the equation of an unbeatable level of insulation. One thing we really like about this boot is that it is highly flexible. So, you’ll find them quite easy to fold and pack up in your bags. Inside the boots is a moisture-absorbing interior. The interior keeps your feet dry and comfortable at all times. Further to that, the boot is rated at -20 degrees Fahrenheit. So, not only is this boot handy for ice fishing but also good for your health. In addition, the boot is designed to be chemical-resistant. Last but not least, it’s made from neoprene which is quite stretchable and amazingly scent-free. 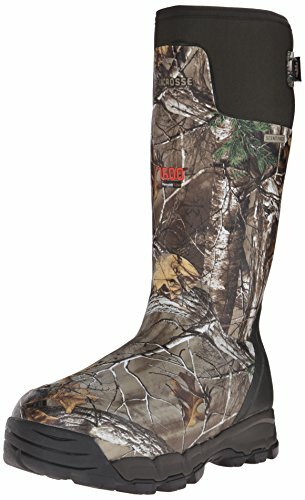 This boot offers an average level of traction. That’s because it comes with a non-marking Chevron outsole which is pretty grippy. 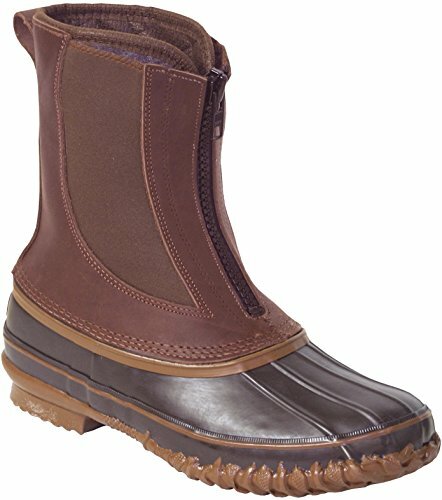 Are you interested in buying the best boots for ice fishing? You probably don’t have a clue what criteria to use. Well, to make the task easier for you, here are the steps we’d recommend keeping in mind. We’d recommend investing in Thinsulate protected boots. This way, you can enjoy warmth and comfort no matter the conditions. Please note that the more the insulation material used, the warmer the boot is likely to be. Ice fishing means you always have to come into contact with water. For that reason, we’d recommend investing in something that keeps the water away. That way, you won’t have to deal with frostbitten toes or soggy socks. This is perhaps the most important factor to consider for ice fishing shoes. We highly recommend going for boots with well-made outsoles. Such soles should be comfortable to help you stand, walk upright and remain steady. Don’t settle for anything with a questionable amount of traction. Almost all the boots reviewed above are awesome. They only happen to have a fair share of merits and demerits. But considering all the features cited on the buying guide, we’d go for the Columbia Men’s Bugaboot Cold Weather Boot (Plus III). It has a remarkable level of traction and is comfortable to wear as well. Other than that, we’d vouch for the Korkers Footwear IceJack Lace Boot for its great design and interchangeable outsole. 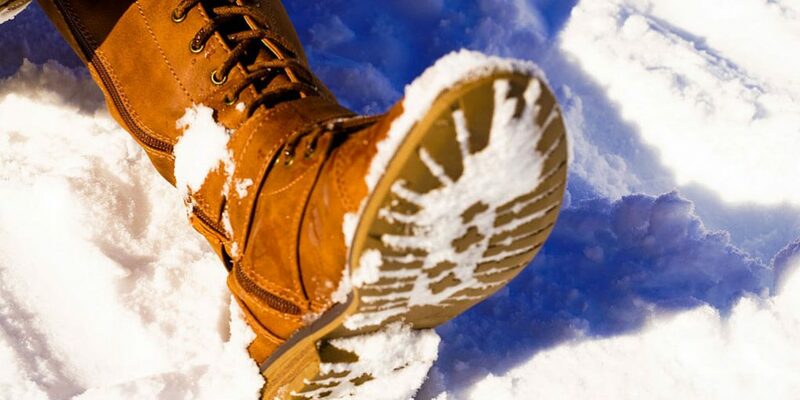 When faced with a harsh environment, you’re better off getting the warmest and most comfortable boot for yourself. Fortunately, all the 12 included on the list above are specially designed to handle tough conditions. You only need to find one that meets your expectations and face the cold temperature with confidence and grit! 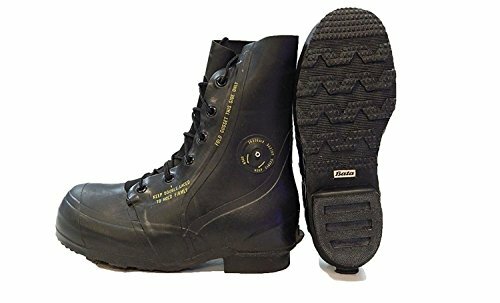 Hi, here I have read an excellent article about ice fishing boots. Undoubtedly it helps me a lot to choose the best one for me, cheers!